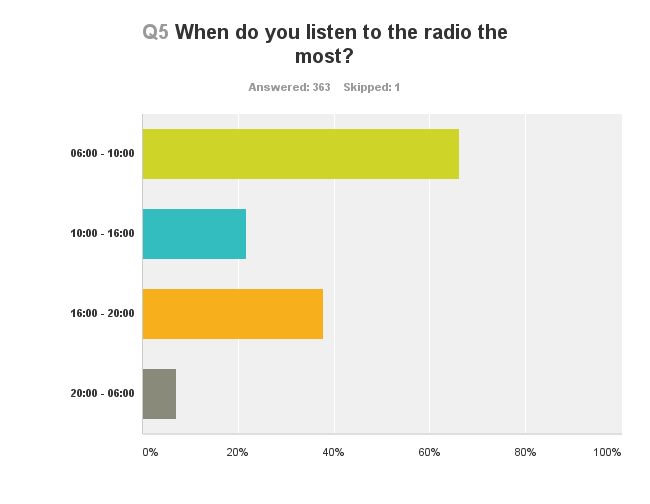 Thanks to all of you that took the time to fill in the survey I posted a few weeks ago about radio here in Oman, it was a great turn out with over 350 responses, and here are the results to each of the 12 questions for you all to see. 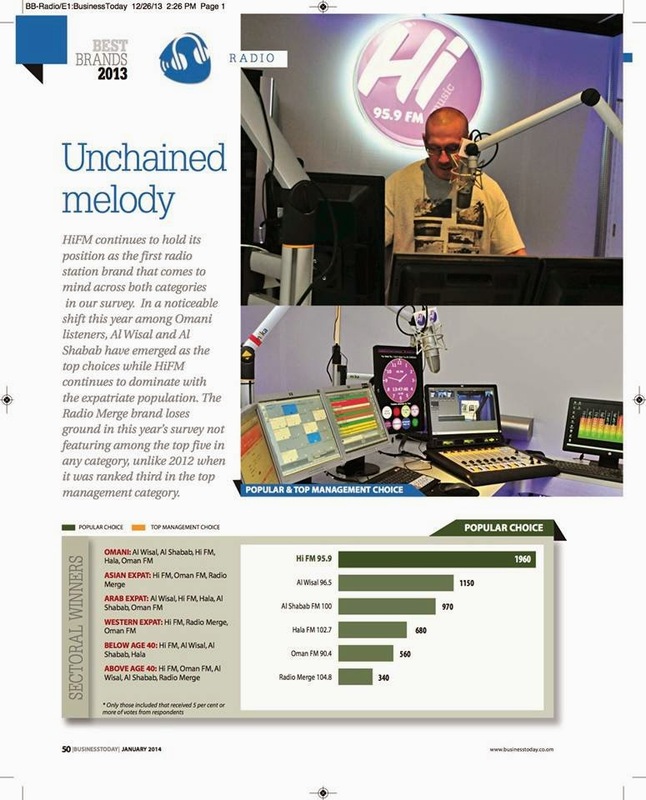 So Hi FM still are the most popular station, but Merge are hot on their heels it seems. 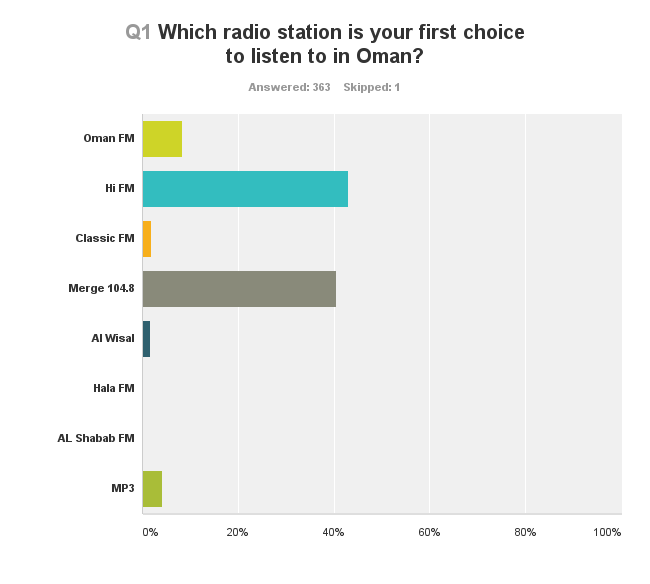 Oman FM are by far the least listened to English language radio station currently. 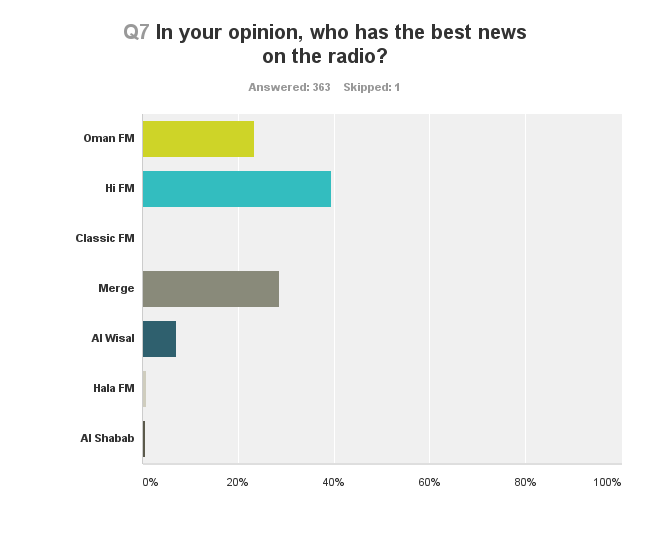 Merge and Hi are practically neck and neck (Merge won by 2 votes) for the 2nd choice radio station - which makes sense because if you're listening to Hi you'll switch to Merge and vice versa, but interestingly some of you choose OmanFM second. 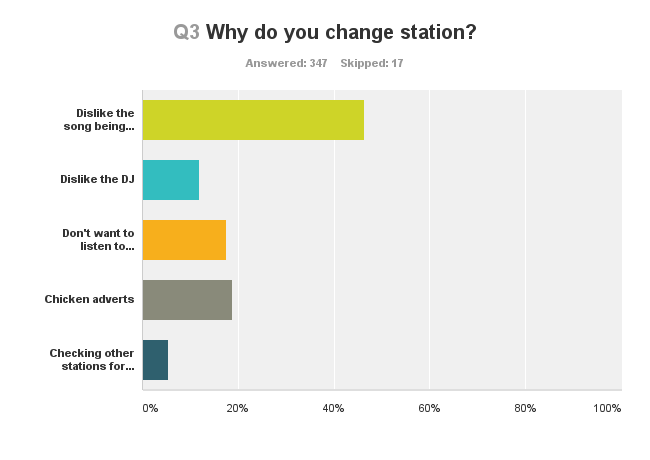 Now, this was quite interesting because I wanted to know why you all changed radio station - the large majority of you say it's because you don't like the song being played (more on that later) - but a large majority of you also said you didn't like the adverts - with the overwhelming majority of the advert dislikers specifically stating they hate the chicken adverts. I must admit, I wonder what on earth went through that companies PR heads when they decided that chicken is "healdy" - especially when fried for breakfast treats. Moronic. They have changed their ad now - but how many listeners did Merge and Hi lose because of that terrible advert each time? Food for thought I'd say. EG - make the adverts better. Well, you all listen in the car, and pretty much no where else! 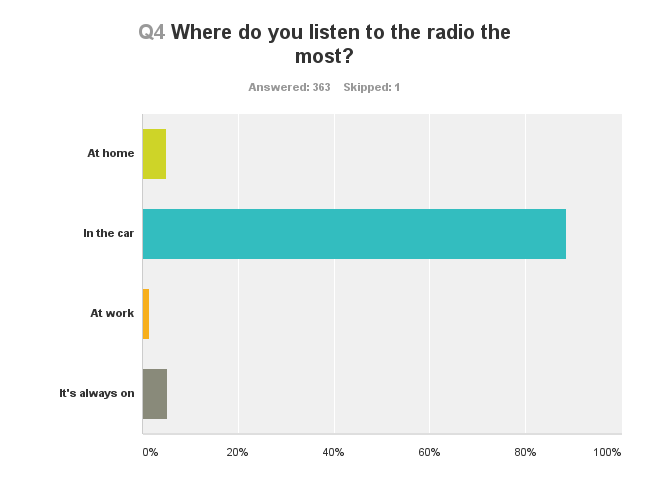 I wasn't surprised by car listeners being the winner, but I was surprised that less people listen when at work. Perhaps this might be because most of you voting on this here blog are in jobs that don't allow you to listen to the radio at work, I don't know. Morning drive time is the busiest time to be on the radio it seems, I was surprised that the afternoon drive home wasn't as popular - I guess because people in different jobs here finish at times between 2pm and 8pm. I found this one strange, because Merge don't really have a news bulletin per-se, but they do announce local bits and pieces a lot and it seems a lot of you like that. 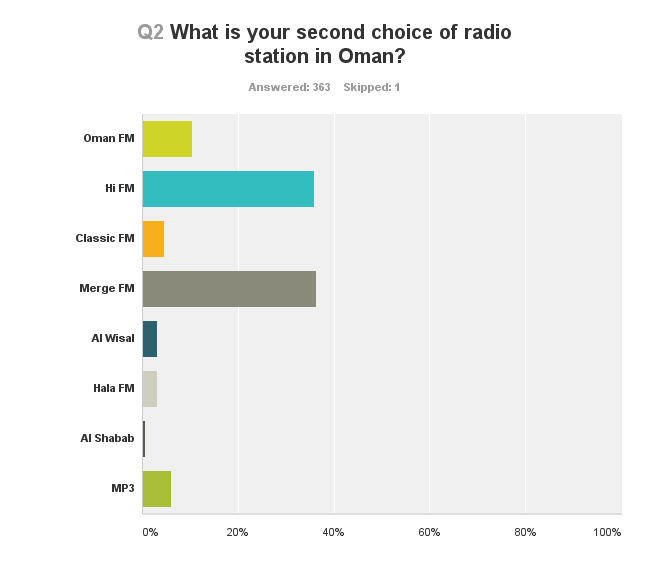 Also worth noting is that Oman FM scores very well (comparative) in the news question, meaning people are specifically turning on Oman FM to catch the news. 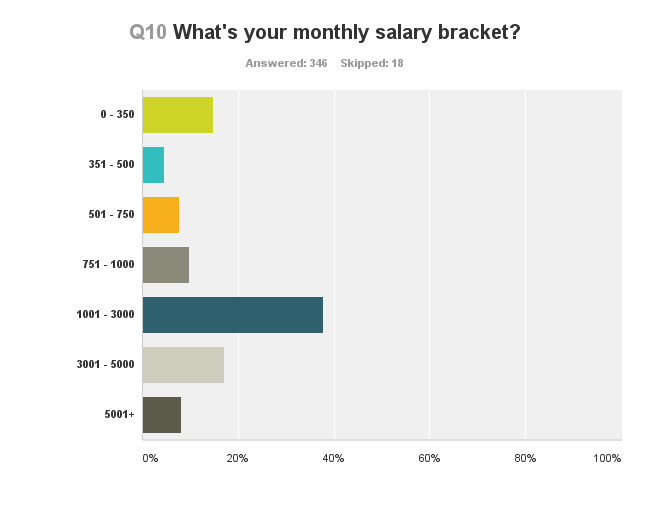 Now that the BBC has joined the airwaves in Muscat now, I wonder if I were to run this survey again in a few months what this questions results would look like? 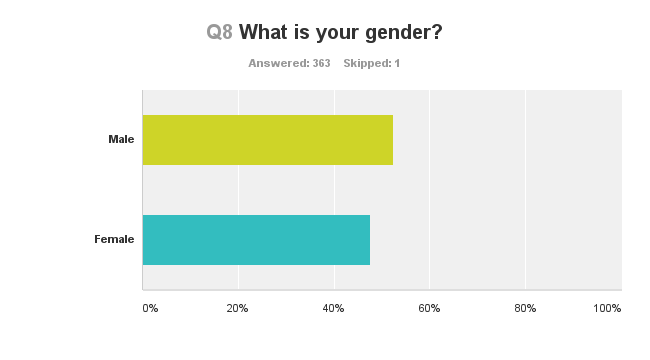 Pretty balanced, but I know from facebook insights that slightly more women than men follow the blog's fb page. I think this is still a good representation of a balanced audience though. Well, I'm in the orange block, and so are most of you! My my, lots of big earners read MM! I think I need to ask for a pay rise!!! 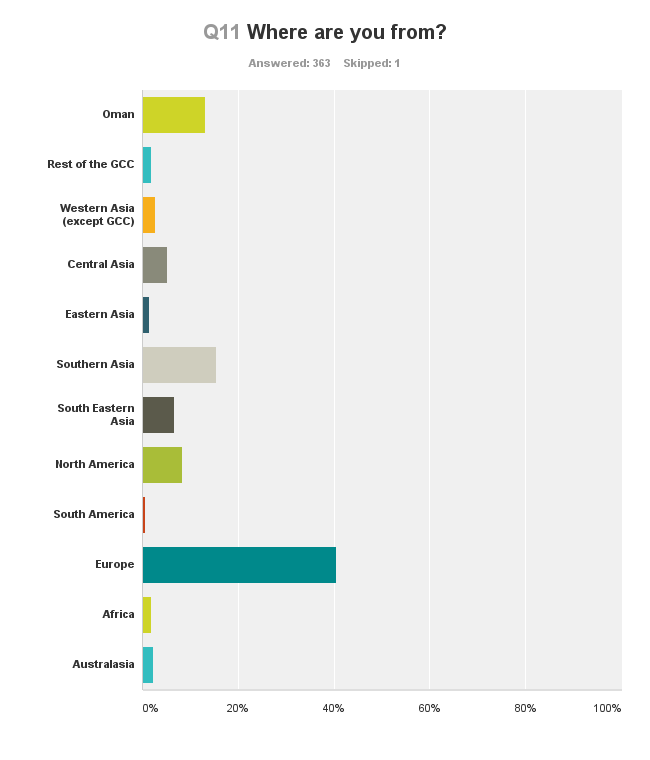 In summary, 46.55% of you are from Asia, 40.5% from Europe, 8.26% from North America, 2.2% from Australasia, 1.93% from Africa and just 0.55% from South America (1 person skipped this question which is why it adds to 99.99%)! 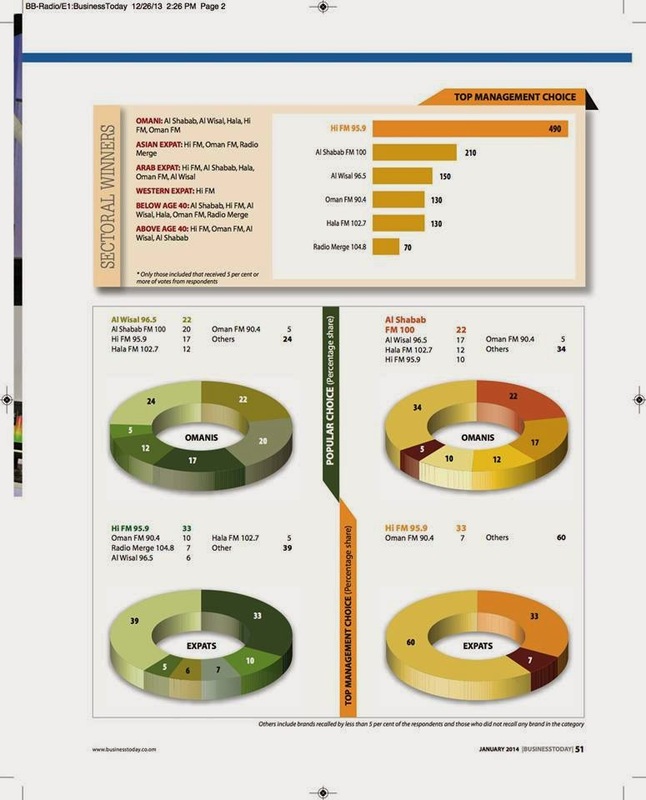 Well it's good that Pop is leading the way, what with that being the music of choice for both Hi and Merge, but it's Rock that is the far and away second most favorite type of music - yet no one really caters to that music type here. R&B and EDM both score very low - perhaps the weekend radio shows might want to be tweaked a little to consider this - I don't know. 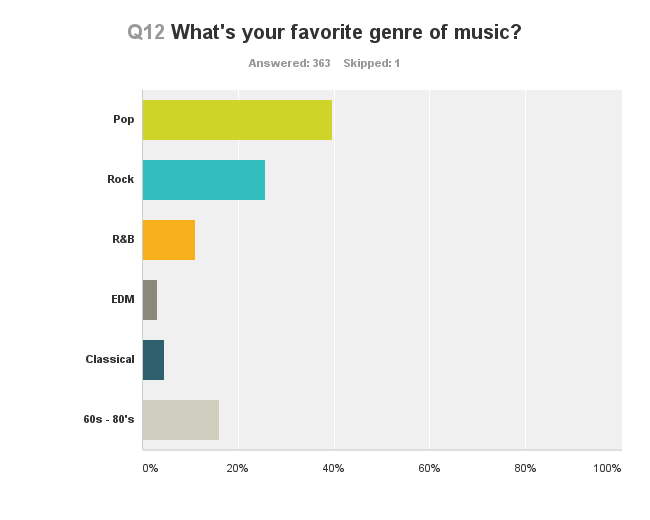 No surprise to me that more people want to listen to rock here, especially on MM. 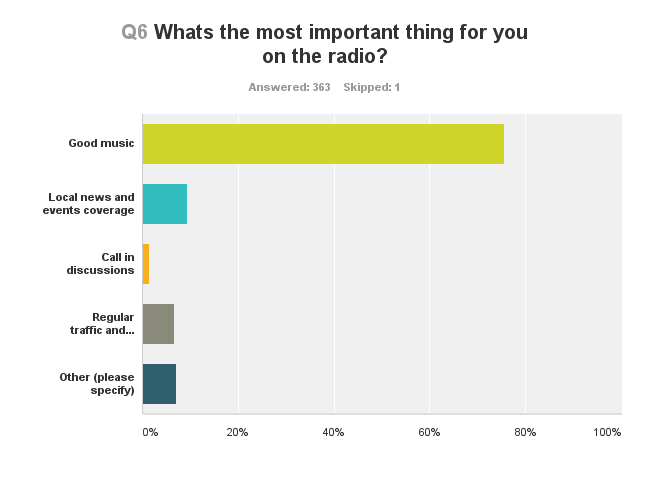 Unfortunately the radio stations are catering to what they think their hosts want as opposed to what their listeners want. This shows what I have previously thought. None of us can really tell the difference between the inane stations. They play the same type of music and the DJs are the same cast offs. It is hardly Capital or Virgin. And the chicken adverts are just legendary. Who paid for them? 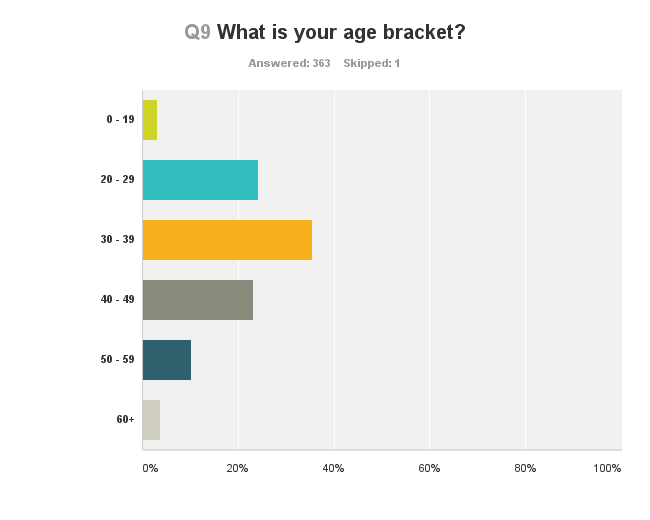 your survey is probably not that accurate. i participated but just clicked anything. To me all the English language music stations are horrid. Annoying announcers, poor out of date music, lack of real local information, and features 'stories' that are geared to people from India with values based on 1940's mentality and a lack of education with regards to family values and so forth. Now, do the survey again, add BBC WorldService. Hands down, BBC WorldService has saved our minds, and I now listen to the radio again, rather than only my mp3's. "Once you Bawwwwwwb, You Cawwwwnt Stawwwwwwb. The Crizzbee Crawwwwwncheee….Chips Oman." Can't invest in proper Voiceover artists. The chicken ads are appalling as is the above rubbish. The Finland (or maybe German) Eye Centre ad was cringeworthy. There are some very good Indian VOs out there, why on earth do you have to use this woman. She's awwwwwwwwbviously related to someone in there. Thank god I'm not alone with the Asafa chicken ads "I too would like some more" said no native speaker ever. The best was the American who was forced (?) to pronounce "OB/GYN" as Aubergine. Since it was an ad for a woman's clinic the mental picture that conjured up was priceless.